I am a sucker for statistics, and I am a sucker for TiVo. While the DVR company has gone to great lengths to assure customers that none of their individual viewing habits will be distributed, TiVo often aggregates larger pools of data and reports on the results - letting us know which actors and actresses are proving most popular, which shows are best seen live, and which are more frequently seen when time-shifted. But I am sure they have the ability to show me my own TV viewing habits, and I beg them to open the vault - to let me know, my statistics. * Over the last 30 days or 1 year, how many shows did I record and later watch? * How many of those shows were dramas? How many were sitcoms? How many were live events? * How many hours have I spent watching Law & Order in the last year? * How many hours did I watch A's baseball? * How many total hours did I watch TV? * Do I watch more TV on the weekends or weekdays? Which days? * What were my top ten shows viewed by number of minutes or episodes? If TiVo can track total viewer data, and I know that it can give me suggestions based on other shows I watch, record and offer "Thumbs Up" or "Thumbs Down", then I know that TiVo can enhance its service by showing me my own viewer statistics. I've moved way beyond the issue of privacy. Google tracks every search I make in my search history. Google tracks how many RSS feeds I read per day, on which day, at which time, and from which sources. Last.FM tracks how often and when I listen to a particular song out of iTunes, and which artists are my favorite. If the data is there to be tracked, then I want it tracked. I want to know if I kept the percentage of "Reality Shows" or "Soap Operas" below 1/2 of one percent all year long. I want to know what percentage shows I see within one day, three days or five days of their being recorded. I want the data. TiVo, I know you are storing the information. Please open up the vault and let us have a peek inside. Update: A must-have for the "My TiVo Statistics" would be the option to mark viewing as being tracked or not tracked, much like Apple has "Private Browsing" for Safari, or Google search tracking can be Paused. If I don't want the wife to know I'm watching South Park, and she wants to hide her watching The View, that works. Also: Take the Poll: What's the Biggest Question Around 2007? LinkedIn is the best tool I've seen for professional networking - offering a way to present one's work history and expertise, as well as find contacts at other companies through people you know. As one's connections grow, your network similarly grows, exponentially. While it's already the best, I believe there are some new features LinkedIn could introduce to further their lead. Of late, the site has expanded, adding tools for importing contacts from desktop mail applications and Webmail accounts, expanded into new arenas, including services, and started a forum for questions and answers, with the assumption being a contact's response within your network will have more validity than a stranger. In addition these elements, I believe LinkedIn could extend its "Answers" service into something more along the lines of an RFP submission engine. Within your profile, you could suggest your business type, your availability for inquiries for goods or services, and buyers could directly connect with sellers. LinkedIn could add a new tab to their site, labeled "MarketPlace", which is buyer-driven, instead of seller dominated. Unlike consumer-focused auction sites like eBay or shopping engine databases like Shopzilla, LinkedIn would connect a business service with an individual profile, who presumably could be seen as being so many steps away from you "In Your Network". Do you use LinkedIn? How else could the service improve? Also, feel free to "Get Connected" or view my profile. 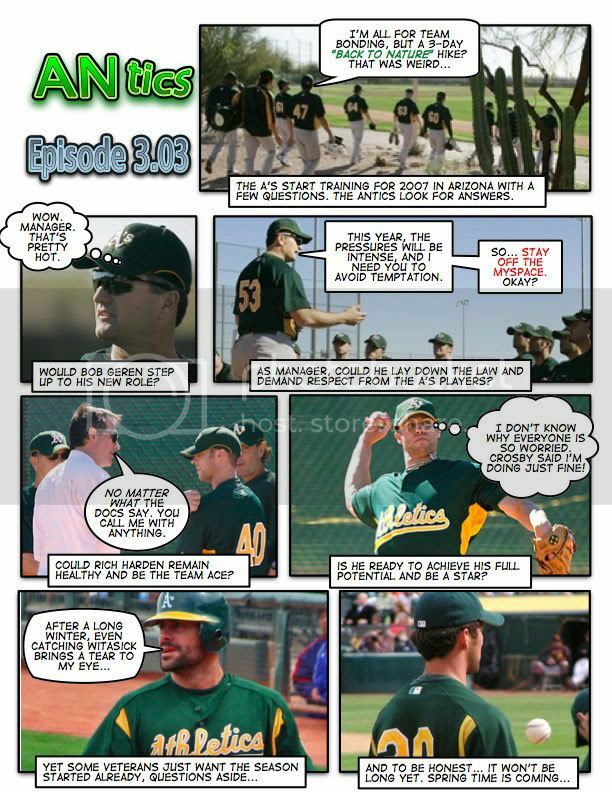 It's never really too early in the year to start fantasizing about A's baseball. After our first full year as A's season ticket holders in 2006, Kristine and I are set to become two-time Spring Training attendees next month, as we plan to travel down to Phoenix and Papago Park to see the A's casually take on four teams in four days. We first partook of the Spring Training experience last year, inconviently arriving in Arizona the same week as rain hit the area for the first time in months. In fact, the much-anticipated Giants/A's matchup was rained out. But we still had fun, catching a pair of games, and relaxing. Though it's still February, we can't wait to take a few days off and welcome the Spring in the right way - with baseball. We will be arriving in Phoenix to see games from March 16th through March 19th, and hopefully will find time to bump into our friends from Athletics Nation. In 1998-1999, when I worked for Internet Valley, a small Silicon Valley startup focused on Web search engine optimization, Web influence and technology trends, we believed that you had to "Get Web or Get Out", meaning that the traditional big companies who had dominated the offline world would need to adapt to the Web or risk being left behind altogether. In the year or so I was at the company, we developed new benchmarks to track a Web site's influence, and even tried our hand at predicting the market capitalization of Web companies looking to go public. Nearly a decade later, it is clear that the Web and the world of e-commerce have had a dramatic effect on the competitive technology and media landscape. It's no mystery that all companies, big and small, have a Web strategy. Some are executing well, while others are seeing their business models completely eroded by faster, nimbler, newer challengers. Foremost on the road to extinction, barring revolution, are off-line media companies, from newspaper giants like the New York Times to print magazines - especially in the technology field. While technology publications used to number in the hundreds of pages per issue, even the leaders are seeing editions with only a few dozen pages, and maybe a dozen ad pages, including house ads promoting upcoming issues or conferences. Smart advertisers are learning that the best way to accurately track their ad spend and subsequent return on investment is through Web advertising, either through keyword sponsorships, ad banners, or customized landing pages and dedicated sites. Additionally, the lead that traditional media once had in disseminating the news is long gone. Rather than wait for the New York Times morning edition or the 11 o'clock nightly news to get the day's information, 99% of news can be found from one's favorite news portal online, RSS feeds, or local sites. We stopped getting the San Francisco Chronicle in 1997, and despite my role in our company's media coverage and tracking, I'm slowly letting my free print subscriptions expire at all the tech magazines that have filled my work mailbox for years. Newspaper circulations are down around the country. Reporters are losing their jobs. But some companies are making change and seeing real results. "The brutal reality that we’re facing today is the costly process of dismantling and replacing legacy operations and cultures and business models with ones with new and yet to be fully proven business models. However, we face greater risks if we don’t transform our organization and take some chances." At IDG, Crawford says that total increase in ad spend online is finally exceeding the decline in the print advertising for the IDG family, meaning the total revenue decline has ceased, that online advertising is carrying a higher burden for sales, and that the success of print is becoming less critical. Meanwhile, the New York Times has seen profit decline each of the last four years, and the near-eventuality is that the Old Gray Lady where "All the News is Fit to Print" may not be in print at all for much longer. The paper's publisher, Arthur Sulzberger, now says he doesn't care whether the Times will be in print in five years or not. We aren't ignoring what's happening. We understand that the newspaper is not the focal point of city life as it was 10 years ago. "Once upon a time, people had to read the paper to find out what was going on in theater. Today there are hundreds of forums and sites with that information," he says. "But the paper can integrate material from bloggers and external writers. We need to be part of that community and to have dialogue with the online world." I've written here before about how the advent of the Web significantly impacted my career path, away from being a reporter, and more toward the world of technology and the Internet. I still work with reporters and media every day, but in a new way, in a new medium. To have expected to stay the course, to hope that things would never change, would have been foolish. Blogs and RSS feeds and instant access to news are changing the way we take in journalism, to the point that even the 24-hour news networks seem like dinosaurs in a fast-moving world, only becoming important in times of crisis or national elections. To stay on top of the news and to maintain true Web influence doesn't take the brand name of the New York Times or the Wall Street Journal as it once did. Instead, consumers and news junkies are turning to their peers, through peer media, to get the scoop quick. For the Times and IDG and others to survive, hard decisions are going to need to be made. Luckily, some are doing just that. One of the goals I have in writing for The Apple Blog is to put out ideas that may not be in the mainstream for Mac users. I hope I can introduce new software products that many aren't familiar with, or to comment on trends, like seeing Apple go to a nearly all-white lineup, or suggest that some products aren't growing as well as others, as I did with questioning iWork's success. Today, I said that I feel Apple should make a change with iTunes (see: Apple Should Drop Notion of “Purchased Music”), in that they shouldn't highlight songs purchased from the iTunes Music Store as "Purchased". The inference I gain from iTunes' designation is that everything not purchased from iTunes would be not "Purchased", i.e. "Stolen". The best example of this would be a dual-CD set I just bought in New York. While I paid $18.99 for it, iTunes doesn't mark it as "Purchased", but just sifts the items in my library, as if they were downloaded for free (i.e. illegal) or ripped from a friend's copy. So far, despite the article's stirring up conversation, many of the comments are quite negative. It seems everybody thought my suggestion fairly daft. One says, "Please take off your Che Guevara t-shirt and put down your anti-drm protest sign long enough to pay attention." Another says, "I think you are a way overly sensitive on this one." Then they pile on. One says, "Make peace with your iTunes and you will find peace in yourself," while one adds, "No ones saying you stole anything…martyr-complex much?" and another... "You’re corporate paranoia has gone just a tad into the red zone." Typos aside, everybody thinks I'm reading too much into it, that Apple is not saying I stole the other 2,000+ tracks from iTunes, only that they weren't purchased from the iTunes Music Store. And of course, they're probably right. I was instead suggesting that the wording could be changed. Are the Apple vs. Microsoft wars in full swing now, again? Has Vista's introduction given Microsoft the momentum back, when Apple's Leopard hasn't shown up yet? Does it really even matter? If you read the conversations of the last few days on the blogosphere, you'd find that for many, choosing one brand over the other in an unholy deathmatch is a choice of finality. VentureFiles: Is the “Cult of Apple” really a cult? And in other news, a year away from votes that count, Hillary and McCain look like the early front-runners for the 2008 ballot. Yet, there's a lot more time, and not every candidate (Gore?) is in the race. Slashdot used to be the ultimate site for all news geek-related. If you got your news article or blog post on the front page of Slashdot, it was hallowed ground, promising tremendous traffic. One of the Internet's new media pioneers, the site relies on users to submit articles, and for these articles to be selected by one of a handful of editors for addition to Slashdot's front page. Yet, for the latest tech news, Digg not only has a wider range of articles, but front-page news hits that community much more quickly. By the time the news hits Slashdot, it's almost guaranteed I've already read it. Today, it was announced that Viacom asked YouTube to remove more than 100,000 videos, ostensibly for copyright infringement. By early morning, Digg user "tommytrc" posted a Reuters story announcing the demand. Less than an hour after his submission, the story had received enough Diggs to be considered popular, making the front page. As of 9:30 pacific time, it had received 897 diggs, and 134 comments. Yet, it wasn't until 7:30 p.m. pacific time that it reached the front page of Slashdot, more than 10 hours later. The second most recent important story on Slashdot at the same time, covers a growing lawsuit against Nvidia by Vista users who feel misled by the graphics card manufacturer. It reached the site shortly after 5 p.m. Pacific tonight. Yet, on Digg, the same frustrations toward Nvidia had erupted nearly two days ago, in a piece submitted by "sadonomic" called "Nvidia - Peeing on the Vista Community? ", which garnered 570 diggs, and more than 200 comments. If Slashdot is to regain its lead in tech news against newcomers like Digg, which rely more on community participation and voting than editor moderation, it will have to make massive changes. Unlike traditional journalism, Slashdot's editors don't author original stories, or add much of an editorial bias, so their role as gatekeepers is highly limited. If the site's editors aren't there to add value, but instead, just to add time, users, like me, are going to move to Digg and leave Slashdot behind.